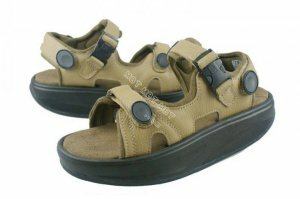 After more than seven years, I have just bought a fresh new pair of MBT sandals. I stand by everything I wrote positively about them previously. If you have high arches and have suffered with arch supports, you should try MBTs. The fog comes on little cat feet, wrote Carl Sandburg in his famous poem. Didn’t he choose a wonderful image there? Little cat feet. What could be quieter? Can you imagine how cool it would feel like to walk on cat feet? Read on. Last June I wrote about my new MBT shoes. MBT stands for Masai Barefoot Technology. Now let me tell you about their sandals. This is the Kisumu Khaki.